I don’t knit a lot of scarves. I know that scarves are popular; I know a lot of knitters enjoy making them; I know most women, and a lot of men, enjoy wearing them. But I don’t knit many scarves because they bore me to tears. You have to knit the same thing over and over and over and over and… well you get the idea. I realize that one can say the same thing about most knitted items, but knitting even a plain stocking stitch sweater includes shaping, necklines, cuffs, and such. The knitter can set goals, knit to landmarks. Even the never-ending sleeves include shaping that keeps you on your toes. Hats are such quick projects that they simply don’t last long enough to become boring. They are finished in the blink of an eye. Ditto for mittens. Even plain stocking stitch socks hold one’s interest because there are heels to turn, toes to make, cuffs to rib. But scarves? There’s no shaping; just a lot of knitting and turning. Even when a scarf includes an interesting lace pattern, even when beads are added, or color work is used, or a ribbed section is made to go around the neck, scarves nearly always bore me. I reach a point on a scarf where I am just sick to death of it because it’s so freaking tedious. Scarves often take a lot of time to knit, and in the end, all you have to show for your work is, well, a scarf. For the Comfort Scarves scarves, I decided to use some old Lion Brand Jiffy, a fuzzy acrylic yarn, that I have had in my stash for at least 15 years, and some cotton sock yarn from my stash that would never, ever under any circumstances become socks. I knew the Jiffy, being a bulky-weight yarn, would knit up quickly, especially since I was limiting the length of the scarf to 65 inches. And I knew the sock yarn would knit up quickly because I was using a dropped-stitch pattern. 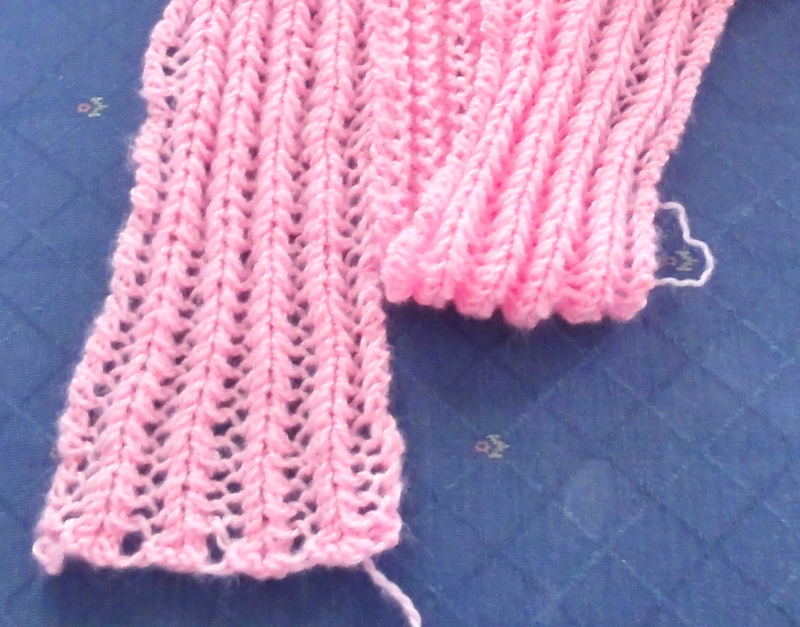 I’m pleased with the results, but I cannot say that I really enjoyed knitting either one of these scarves. However, they were both mindless knitting, which is just what I needed while watching my beloved Penguins lose in the first round of the Stanley Cup playoffs. Grrrrr. A little digression here. Acrylic is, as I said, an ungiving yarn. One of the advantages of acrylic is that it keeps its shape. It doesn’t stretch out in the wearing or in the washing. But that can also be a disadvantage. With wool, you can change the size and shape of a garment when it is wet, and the wool will dry to that size and shape and retain that size and shape until the next time it is washed. With acrylic, even if you stretch it out when it is wet and keep it stretched until it dries, once you release it, the item will go back to its original shape. If you want to change the shape of a garment knitted in acrylic, you have to set the shape with heat, a process commonly know among knitters as “killing” the acrylic. “Killing” is permanent, and it changes the drape and feel of the yarn. It is also risky because too much heat will melt the acrylic, which is a plastic, and make it feel like Easter basket grass. But when you knit lace with acrylic yarn and you want the lace to open up, “killing” may be necessary, and it has the added advantage of making the item very limp–at least this is an advantage if the item is a lace scarf that you want to drape softly. Pink Lacy Rib Scarf before "killling"
Pink Lacy Rib Scarf after "killing"
If you use the right yarn (bulky) or the right pattern (dropped stitch), and make the scarf short (but not versatile), knitting a scarf can be quick and tolerable. But knitting a scarf in a beaded lace pattern in lace-weight yarn to a length that will make the scarf a versatile garment is never quick. And the scarf usually becomes a total drag for me before it is even half-way done. 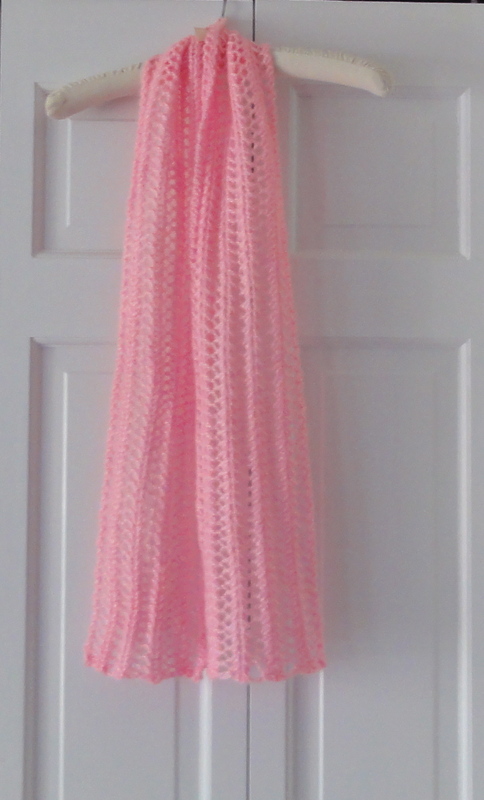 Once time I did knit a lace scarf that I enjoyed knitting start to finish–Fuzzy Pink Elegance Scarf. But that scarf is the exception that proves the rule. Even when knitting a really interesting and well-designed pattern like Jackie E-S’s Beaded Lace Scarf, I got bored before I was half-way through and now I have to employ Premack’s Principle, which can be summed up as “business before pleasure.” I force myself to complete one pattern repeat before I can work on knitting that is more interesting, fun, and pleasurable. And I have to finish the scarf before I can start any new project except socks or a hat. 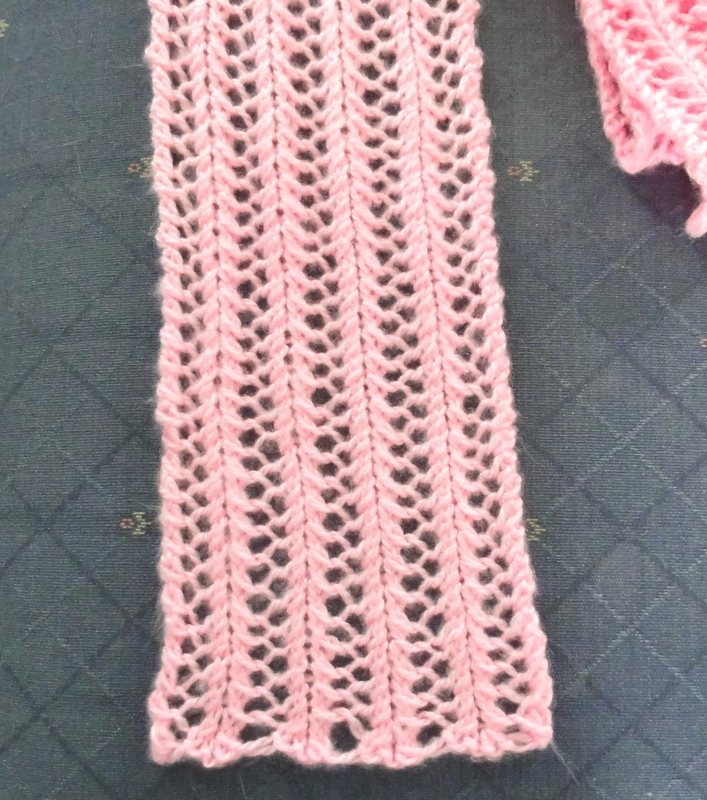 I keep working on the scarf because the pattern is gorgeous, and I know I will love the finished object. But I’m no longer lovin’ the knitting. Sigh. For reasons I cannot explain, I rarely get bored with lace shawls, even when the edging, whether knitted first or last, seems to take forever. Maybe the reason is that lace shawls almost always change shape. You see them grow or shrink, you change from knitting a center to knitting a border, you work an edging. Even rectangular shawls can be interesting. The lace pattern is always changing, and it’s fun to watch each pattern develop, take shape, become recognizable. I have a pattern for a lace scarf that uses a variety of lace patterns, and I keep telling myself that it would be really interesting to knit. But I know I’m deluding myself. It is a scarf, and it will start out great, but by the half-way point, it will be b-o-r-i-n-g. But it is a lovely scarf, so I know that one day, against my better judgment, I will cast on with great enthusiasm, only to find myself falling back on Mr. Premack and his Principle. But I won’t be knitting any more scarves for a good long while because as soon as I finish Blue Teardrops, I’m going to treat myself to knitting a lace shawl, The Spider Queen. This entry was posted in Knitting, lace scarves, Lace Shawls and tagged "killing" acrylic, beaded knitting, knitting and hockey, Pittsburgh Penguins, stanley cup playoffs. Bookmark the permalink.